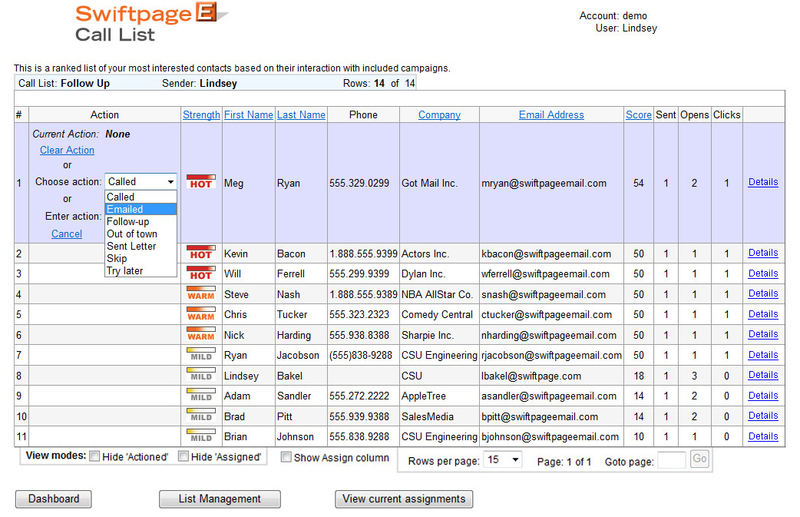 The Swiftpage emarketing Call List gives you insight into who your most interested contacts are. Swiftpage emarketing assigns a score to each recipient based on their interaction with your email messages – giving you a ranked, qualified list of who to call first. Gain confidence that you are only calling qualified contacts in your database with Swiftpage emarketing Call List. Each contact is given a simple hot, warm or mild ranking to help you discern what action to take next with what contacts. Create actions such as Called, Sent Letter, Emailed, Follow-up, Out of Town, or enter your own action to keep track of how you have interacted or should follow-up with each contact. Use the Call List filtering options to segment your Call List and assign lists among your sales team members to follow up and close sales. Form groups out of your hot, warm and mild contacts from your Call List for more focused, future emails. Email your entire Call List or a filtered version to any email address for their review or to follow up.